Oh how I adore baking. This month has been nonstop already, and between work and leaving town a lot and playing in the kitchen, it’s been a wee bit stressful balancing it all. So when I’m stressed out, then I bake. Feeling the need to bake had me thinking I hadn’t made a galette in AGES, so I bring you this fabulous Pear Cranberry Galette. Galettes are really fun to make, and super pretty! Kind of think of them as a free form pie, where you don’t need a pie pan and “rustic” is the theme. 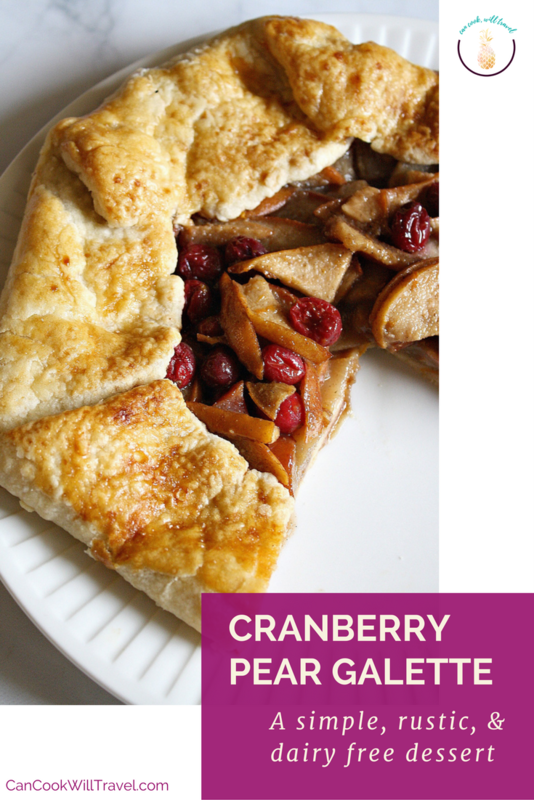 If you haven’t tried galettes, then there’s no time like this Pear Cranberry Galette to give them a whirl. At first I was inspired by the Apple-Cranberry Pie I made years ago that is super delicious. But then I wanted to go with pears instead of apples. Pears are a fruit that I love, because they’re tender and remind me of apples without the big crunch. But I haven’t cooked much with them here on the blog. And in this week’s What to Cook in December post, I shared that pears are a fruit that are in season this time of year. 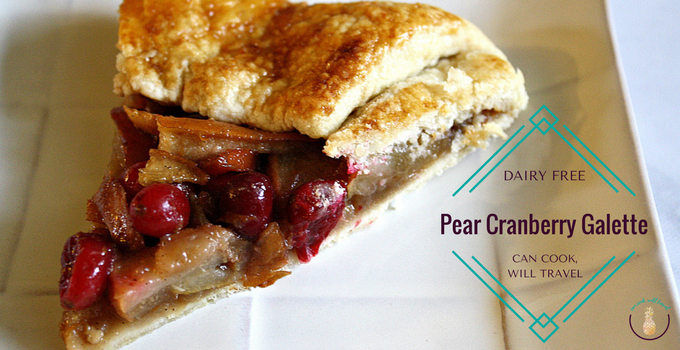 I pretty much made this Pear Cranberry Galette recipe up right before I started creating my it. You can use puff pastry, which is what I used with my last galette, or make your own pie crust. Feeling ambitious, I made a crust using my aunt’s recipe, because it’s one that my sister and cousin love. I totally know why now that I tried it. It’s super easy and pretty fool proof. I’ll probably share it eventually here, so stay tuned for that. The filling is really easy, so it can be made very quickly. I thinly sliced 3 pears, although 2 probably would have been fine. Then I added some cranberries to the bowl along with orange juice and zest, maple syrup, coconut sugar, vanilla bean paste, almond extract, cinnamon, nutmeg, cardamom and some corn starch. Stir together the fruit and flavors, and then roll out the pie crust into a circle. Fill the center with as much topping as you’d like. Leaving about a 2-inch border all around, you’ll then fold up the sides and it leaves an opening in the center where you can see the filling. There’s no right or wrong way to do this, because you’re main goal is just to make sure the edges are all folded up to encase the filling. Remember rustic is our word for this recipe! I sprinkled coconut sugar on top of the crust and filling and baked away for 35-40 minutes or until the filling is bubbly and the edges start to turn golden brown. First of all, I may never buy pre-made just again. Okay, never is a strong word but my pie crust is tender and delicious. Plus it’s easy! I wanted to keep this fairly healthy by not using refined sugar or dairy. So my crust has shortening in it, and the sweetness I used was coconut sugar and maple syrup. Using the coconut sugar was a bold move, but I’ve been using it a lot lately. I thought it would actually give a deeper, richer flavor than traditional granulated sugar. And the maple syrup also gives deeper flavor. The spices added a nice warmth to the filling, yet they weren’t overpowering so you could still taste the fruit. And I knew the addition of the almond extract was critical the instant I stirred it in, because it gave this wonderful boost to the sweetness. I found it was a game changer in helping to balance out the sweet and tart notes of the recipe. Now I thought about cooking the cranberries and making a sauce out of them to add to the Pear Cranberry Galette. But I ended up just adding them whole and letting them kinda burst and mellow out as they baked. I love this idea, because you’d have the mild pears with a burst of tartness (yet not too tart) as you ate. 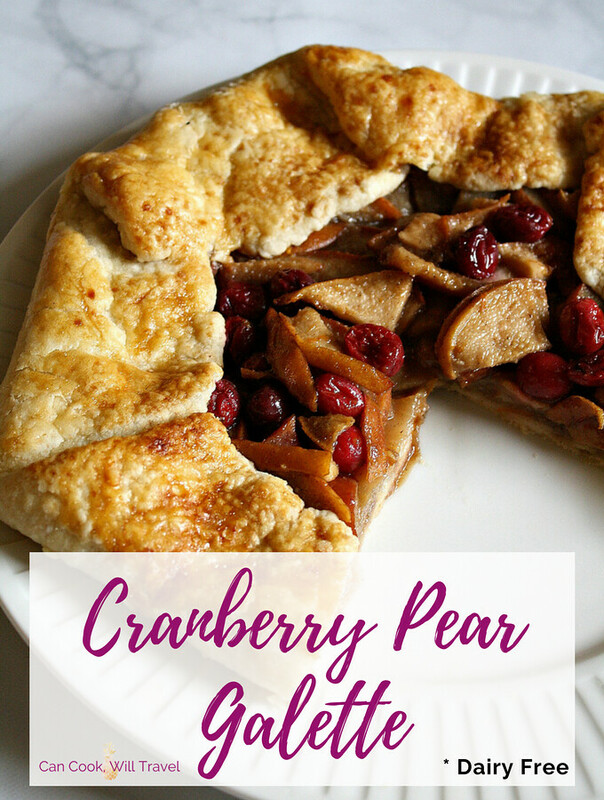 If you’re needing a dessert and need an easy recipe, then this Pear Cranberry Galette is a great option. It’ll be beautiful and look like you tried super hard on it, yet you’ll known it was easier than pie and just as delicious! Plus it’s pretty perfect for the holiday season! So click that link for the recipe and step by step instructions, and then happy baking! Two years ago: Roasted Butternut Squash and Bacon Soup . . . Delicious! Four years ago: Beef and Broccoli – Don’t Mind if I Do! Six years ago: Chicken and Wild Rice Soup that Hits the Spot!